Michael Crabb of the Toronto Star is one of Toronto’s dance authorities. This season, Crabb wrote five preview articles about most of our Mainstage productions. Here is a little of what he had to say. Next came RUBBERBANDance Group from Montreal. 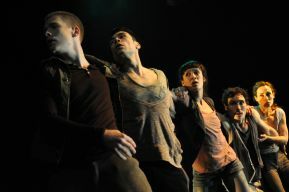 Crabb of the Toronto Star described the inspiration for the work,”it was the ricocheting financial crisis triggered by the collapse of Lehman Brothers in 2008 that set acclaimed Montreal choreographer Victor Quijada on the path toward Gravity of Center.” Hundreds of screaming teenagers attended two matinees of Gravity of Center. 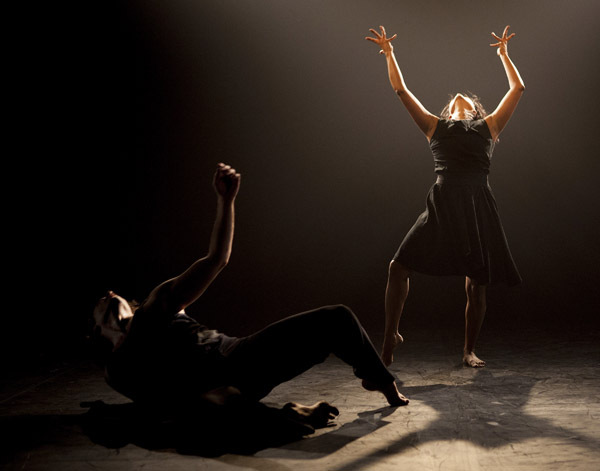 It quickly became the best selling show in DanceWorks’ history. Then the lovely Miriam Allard arrived in the cold of February with her intriguing Homoblablatus. “Be prepared for a ‘virtual’ duet between a live dancer and her on-film partner, and another in which two dancers occupy the same signature frilly flamenco skirt. And expect to leave with your notions of flamenco turned deliciously upside down.” mused Crabb. Thank you Mr. Crabb for your dedication to contemporary dance in Toronto.